It’s Sunday. The day I pour my life into yours. The day I tell your story. A story of courage, hope, or inspiration. Throughout history there have been epic battles fought in the ring: Ali vs Frazier. Leonard vs Hearns. Tyson vs almost anyone in the 1st round. Even the make-believe heavyweight fights we love up on the big screen, including the king of them all, Rocky. Then there are the epic fights which might take place just around the corner, sometimes in the shadows, without fanfare, but with a much deeper meaning than a simple sporting event. A battle for survival. This is the story of one such fighter, Daron Fisher. 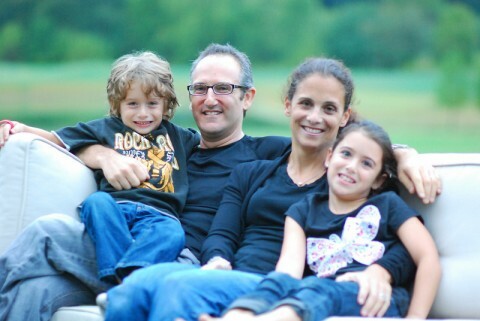 It was August of 2010, Daron, a healthy 43-year-old father of two suffers a seizure on the train ride back from New York. He was returning from helping with a marketing campaign for MGH advertising. For Daron, the job he loved was about to take a back seat to a bigger challenge; tests showed a small mass inside his brain, a tumor. Daron’s wife Beth remembers the time well. She recalls the need for immediate surgery and then test after test after test. Weeks passed and then what Beth describes as an “insane sick feeling,” when the doctor read the results: brain cancer, specifically a glioblastoma, prognosis on survival with treatment…about 15 months. The good news, the specialists said the tumor was small, about the size of a jelly bean and when they removed it they got it “all”. Except when it comes to the “C” word, getting it all doesn’t mean it’s all over. A tumor in the brain is like a pile of sand, you can remove it but there may be a grain or two that shakes loose. Despite Daron’s incredible positive attitude, healthy living, better diet, increased exercise and the like… the smallest of possibilities, that tiny shadow of a doubt, that grain of sand, re-surfaced. The tumor returned. The week of Thanksgiving 2011, Daron was back in surgery, but this time the tumor was too close to a blood vessel in the brain and the doctors couldn’t get it “all”. Time was no longer on Daron’s side. Throughout the ordeal Beth and Daron chose to keep the diagnosis a secret from their young children, Emory and Alana. They didn’t want to burden their kids with worry, fear, sadness and the realization that their father and the life they had come to know would never be the same. So for the Fisher kids life went on pretty much uninterrupted. Daron still coached Emory’s baseball games, went to Alana’s gymnastic practices and the family did what families do best when love is at its core… spend time together, enjoying this journey we call life, made all the more fulfilling when you share it with the people who share your heart. 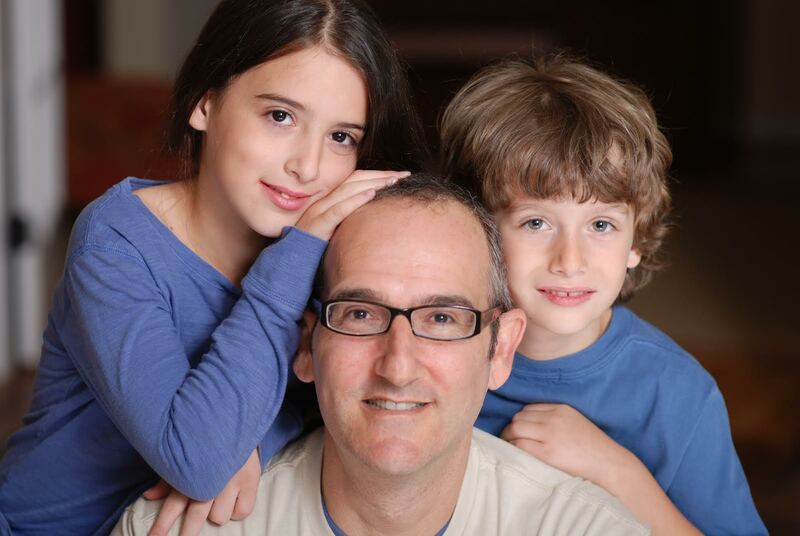 In the meantime, Daron went on secret doctor appointments, endured chemotherapy and radiation. He sought out aggressive treatment through the National Cancer Institute, and Beth and Daron were aided and supported by a great friend and advocate, Ellen Hakim. But despite everyone’s best efforts and a number of alternative therapies, by October of 2012 things were getting worse, not better. 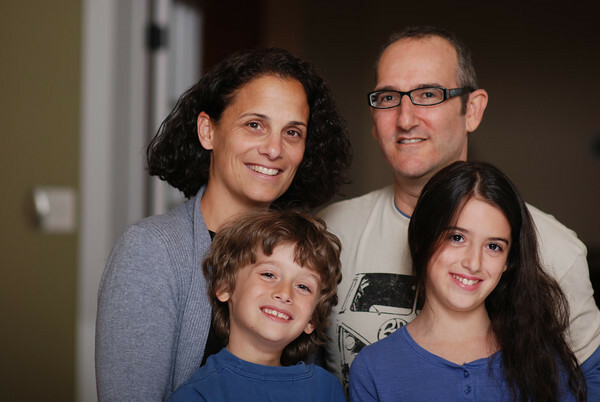 To try a device called Novacure, electromagnetic headgear designed at “zapping” the brain cancer, Daron would have to shave his head…now the kids needed to know. Beth remembers she had never used the “C” word, but now there was no choice. Beth says telling their children was not, as she remembers the “most awful thing ever”. “I imposed expectations that didn’t surface”, says Beth. And her children, now ages 8 and 11, took the news in stride, proving their resilience, yet at the same time shielded by a lack of life experience to truly comprehend the outcome, one which, unless there was a miracle, would one day leave them without their “Daddy”. As time ticked away, the cancer continued to take its toll and the calendar turned to 2013. 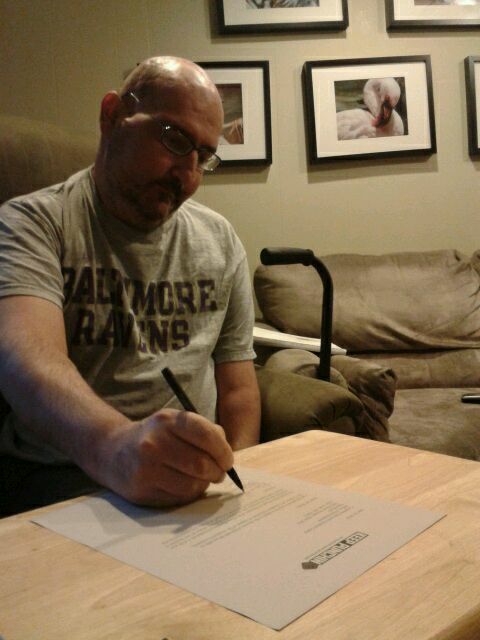 In January, the illness was robbing Daron of his strength and he was forced to go on disability. Even worse, he could no longer do one of the things he adored… play guitar. It was devastating to Daron, but his will would not be defeated. Daron started telling Beth stories, including one from years ago in which his uncle, a media promoter, had secured a media kit from the movie Rocky II and had given it to Daron and his brother. 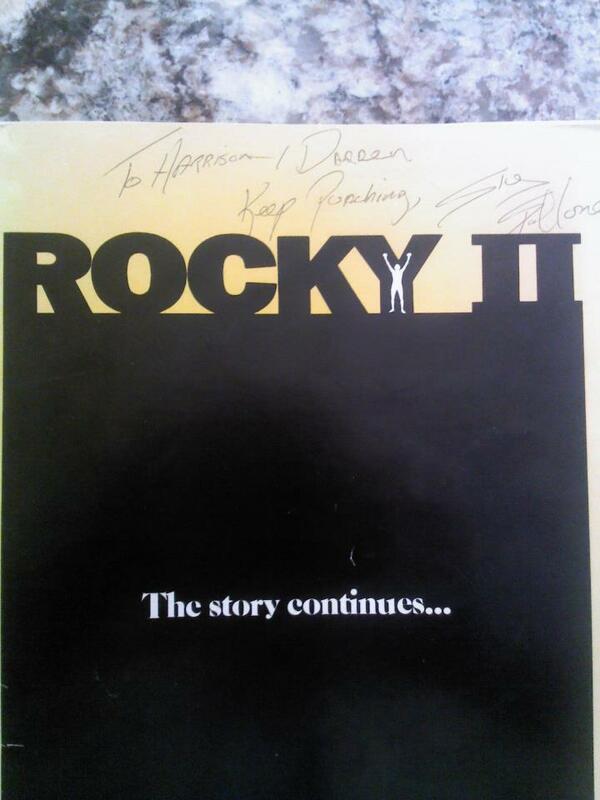 The poster, signed by Sylvester Stallone himself, read “Keep Punching”. An idea was born. Daron and Beth wanted to find a way to give back. There was a special researcher, Dr. Fabio Iwamoto, whom they met at the National Cancer Institute. Dr. Iwamoto had gone above and beyond, following their progress, checking in with late night phone calls, showing caring and compassion. 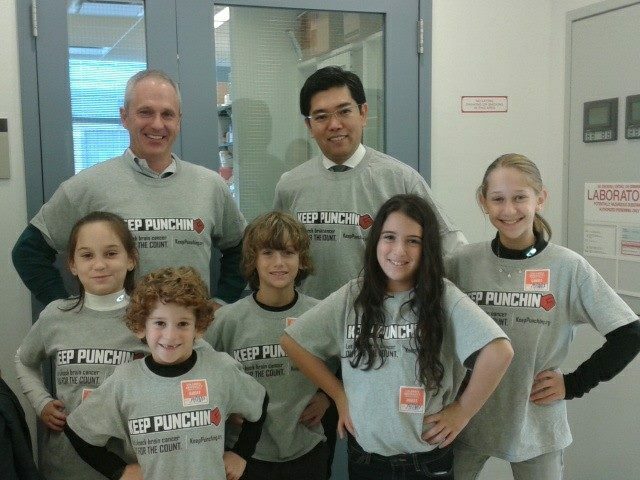 Beth and Daron thought how great would it be if they could find a way to raise money to fund Dr. Iwamoto’s research at Columbia University in New York. A small idea became a big hit and Keep Punching, with a big hand from Beth’s good friend Jen Johnson, orchestrated a major fundraiser on March 23rd of 2013. More than 225 people attended the event at Frazier’s Restaurant and Bar in Hampden, Maryland… even Daron was able to make it, and so together a village of love and support raised $20,000. They say it takes a village to raise a child, it takes that same village when a family is in pain, providing love and support so desperately needed to see them through. Keep Punching was a huge success (www.keeppunching.org). And there was another milestone to come. The Fisher family and the Hakim family traveled to Philadelphia in the early spring of 2013. If you’re going to keep punching, it means you must be fighting…. and because of Daron’s hard work and intensive therapy, he was able to accomplish a dream. Daron climbed the “Rocky” steps, and for a moment make-believe became reality. For a moment, the “C” word changed from cancer to congratulations. For a moment, Daron got the chance to taste victory, a delicacy not so prevalent in the 2-1/2 years since his life had changed forever. And Daron was already beating the odds. The doctors said 15 months, by this time, Daron had doubled down. Beth met Daron back in 1996, both of them worked at TBC advertising agency in Baltimore. They were wed in 1999, and danced their first dance to More Today than Yesterday… “I love you more today than yesterday, but not as much as tomorrow”…lyrics that launched Beth and Daron’s lives together and still ring true today. As the years moved forward, Daron and Beth brought two children into the world, and created layer upon layer of memories. But on August 9th, 2013, their lives together became just that… as Daron passed away, with his family by his side, succumbing to the brain cancer which three years earlier surfaced on the train tracks heading home. When someone you love becomes a memory, that memory becomes a treasure. Inside all of us are hidden treasures. The great challenge in life is not to die with that treasure hidden inside you. Daron Fisher brought his to the surface for all the world to see, as a loving husband and a devoted father. He displayed great wit, especially in his work as a talented copywriter. Just last month Daron was honored posthumously with a Lifetime Achievement Award by the American Advertising Foundation. But his greatest rewards were his family and friends. Beth says, “everyone who knew Daron and knew his wit and his kindness…everybody loved him, no one could say a bad word about him. He was caring and loving. I want Daron to be remembered for who he was and not for who he became.” It was the cancer that robbed Daron of his freedom of movement, and his ability to think with clarity, but not his spirit. His brain was ravaged by the beast, but his heart still full with the more than forty years of the love he gave and received. A fighter to the end Daron Fisher went the distance. He gave it all he had. Daron kept punching and fought more rounds than any scorecard could ever record, and in the end he went down for the count. But there’s a huge difference between losing a fight in the ring and the one outside the ropes. For Beth, for Emory, for Alana, for all the family and friends who Daron touched and who gave that love right back…that village knows another champion. One of The Greatest, Daron Fisher. I knew a sliver of this story before. When you noted Ellen Hakim as ‘great friend & advocate’ I choked up. Ellen & her husband Danny took care of my late husband when he was fighting the fight of his life. You couldn’t ask for more wonderful people to come into your lives. It is a privilege to know them (& their darling family that I see in the picture); I am lucky enough to still be in touch with the Hakim Family. So, this “Fight to the Finish” I can so relate to. Thank you Mark for this very inspiring story. It’s a small world. Thanks Marilyn. Thank you for this amazing tribute to Daron and the Fisher family. Their courageous battle through this horrible illness and continued strength as they fight to help others and find a cure are inspirations to us all! It’s an honor David. Thank you. As you do every week, mark, you have brought great humanity to the story of the Fishers! They are am amazing family and your story brings comfort, joy, and even a tears to those who loved Daron!